In the 1861 census of England, the sister of one of my ancestors is shown living as a 'nurse-child' some distance across London from where her mother was in hospital. How would the placement of a nurse-child have been arranged at this time? Mary Agnes Wright, oldest known daughter of John Charles Wright (1828? - 1904) and Ellen Brown (1829? - 1871) (also known as Caroline Ellen Brown), was born on 3rd July 1859 in Hitchin, Hertfordshire, England. John Wright worked variously during his lifetime as a Grainer, a Painter and Glazier, a Decorator and a Photographer. Agnes's brother Stanley Reynolds Wright (later known as Stanley Wright or John Stanley Wright) was born on 27th May 1861 in Plumstead, Kent, England. Agness Wright is a nurse child with the Papworth family in St. Pancras, Middlesex (RG09 piece 105 folio 58 page 28). Of note? Henry Papworth, head of the family was a Painter. In the 1871 census (2nd April), the family (John, Agnes, Stanley and youngest son George) was reunited in Waltham Cross, Cheshunt). Ellen died on 10th February 1871, also in Cheshunt. 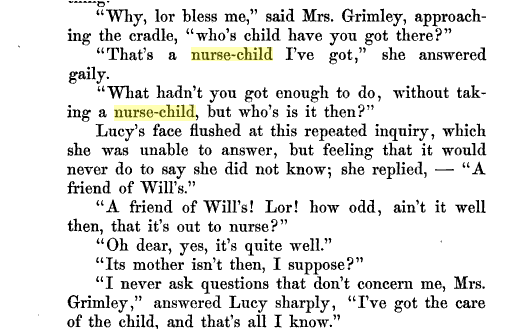 ColeValleyGirl wonders how the placement of a "nurse child" would have been arranged in the 1860s (UK). I was not familiar with the term "nurse-child"/"nurse child" (as opposed to terms like "nursemaid," or even "wet nurse"), but the term seems well established. In use, I found its meaning could vary; good chance the term was more prevalent in the UK. Hall Genealogy Website: Old Occupation Names, entry for "Nurse Child." "A child being looked after by another family for payment." "Bastardy and Baby Farming in Victorian England"
Dorothy L. Haller's article (1989), "Bastardy and Baby Farming in Victorian England," won an award from Department of History at Loyola University (New Orleans). I found the article exceptionally well referenced. In Haller's article, the term "Baby Farming" was closely associated with term, "Nurse Child." Haller cites news items of the relevant time (1860s). One such reference was "Baby Farming," from "Pall Mall Gazette, January 31, 1868, p. 5.x." It was least Haller's finding that most of the advertisements were "aimed at the mothers of illegitimate babies." A short clip follows from Haller's work. Please see the article for more details and specifics of her other references. NURSE CHILD WANTED, OR TO ADOPT -- The Advertiser, a Widow with a little family of her own, and moderate allowance from her late husband's friends, would be glad to accept the charge of a young child. Age no object. If sickly would receive a parent's care. Terms, Fifteen Shillings a month; or would adopt entirely if under two months for the small sum of Twelve pounds. Before the Elizabethan poorlaw was changed ... [the] care of illegitimate children and their mothers was haphazard. The ... poor law changed this and placed the responsibility on the mother [who may have been] unable to hold a job and to feed the infant. One solution ... was the baby farmer [who] would for a small fee, offer to take care of the infant. As soon as the money stopped coming (or before), the infant would be starved to death or just dumped in a convenient place. This procedure continued until the end of the century when horror stories in the newspapers, compelled the government to act. The research I did suggested a wide opinion about the circumstance of "nurse child," including that it frequently referred to situations that do not seem related to ColeValleyGirl's case. We aren't sure of where or when the parents married. Are there hospital archives that explain more about the woman's hospital stay? The "insanity" question on Genealogy.SE some time back gave some information about women being admitted to hospitals for pregnancy or childbirth related conditions--but there wasn't great frequency. If the stay were to have extended through the birth of the child, it would have been pretty long (from likely before but at least by the date of the census though maybe the birth of a child; say 2 months). Lack of other options--would there have been no family or friends who could care for this daughter if her mother had taken ill? As GeneJ says one possible line of attack is to see if there are any records surviving relating to the mother's hospitalisation. The National Archives have a Hospital Records Database which has a record for Guy's. It's quite a long list of locations, but the London Metropolitan Archives and the Wellcome Library look like the most likely places to hold whatever patient records survive. A Google Ngram shows that "foster child" was used 7 times as often as "nurse child" in its corpus from 1861. More detailed analysis suggests that by that time, the most common usage of "nurse-child" was in medical texts and journals. Of course, it is the job of the family historian to ask exactly those questions! What can I deduce if a grave is re-used?